Almost all cities of the upcoming World Cup are globally recognisable. Almost, because Saransk wasn't until this tournament. The republic of Mordovia is one of Russia's smallest and Saransk itself with just around 300,000 people is the smallest host city. Thus the limited hotel and transport options and along with them – high prices for visiting supporters. So why did Saransk get on the World Cup list? Quite simply, they started work long before most cities did. 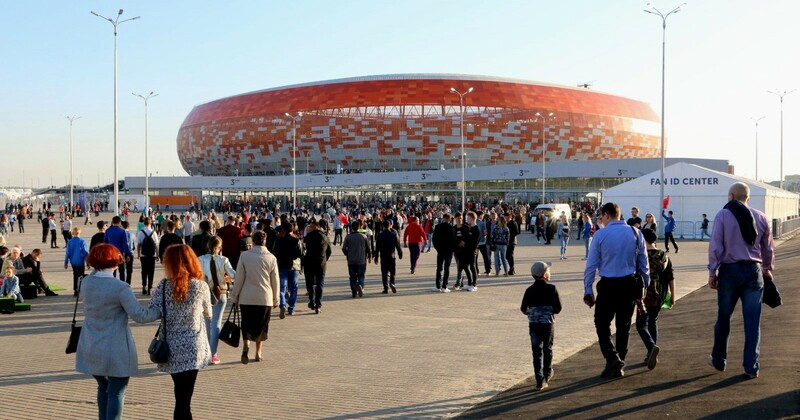 Replacement of the old municipal stadium in Saransk was planned regardless of the World Cup effort, ahead of the 1000th anniversary of Mordovian unification and the 2012 Spartakiad. 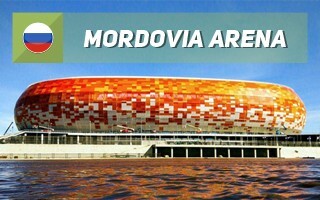 Advanced preparation was among the reasons for the inclusion of Saransk, while much greater city of Krasnodar was dropped from the host list. Floodplain of the Insar River was selected as construction site, due to its optimal location almost at the heart of the city. The 23-hectare plot became part of the new Jubilee district, celebrating the millennium of Mordovia within Russia. Ground works began back in 2010, before FIFA decided to award the World Cup to Russia. The ambitious beginning put Saransk at an advantage, however works soon came to a halt as the Mordovian government transferred the project to the Russian federal authorities and initial design began changing in order to accommodate greater crowds (45,000 instead of initial 28,000). 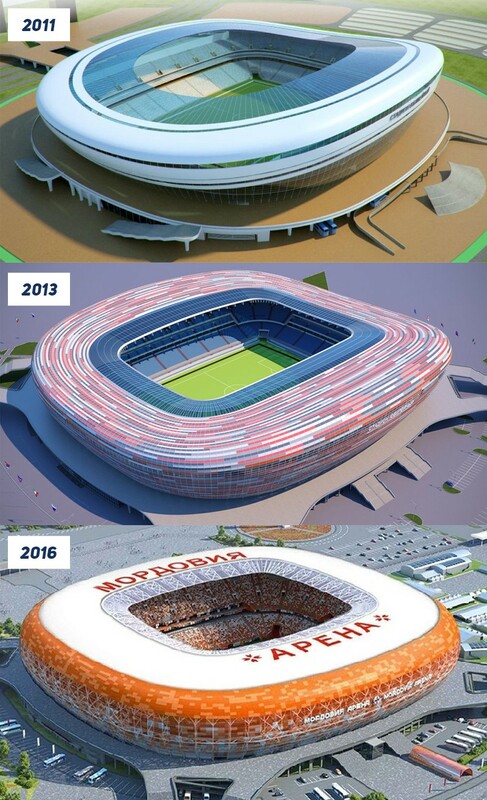 As a result, the stadium was still in foundation phase in 2012-2013, when it was supposed to be ready. Effectively the stadium was redesigned several times with work already ongoing, leaving little from the original concept and not even getting close to what was presented to FIFA in the bid book. The early vision suggested an opaque white stadium with vast glazing and a dynamic, floating outer form. The west stand was also expected to get a media facade. During construction a lot changed, starting from the outer promenade (with access staircases eventually shaped like a cross to mimic the solar symbol of Mordovia) and ending with the self-sustaining dome itself. It was last changed in rather unfriendly circumstances, after the 2015 economic collapse and necessity to cut cost wherever possible. The dome was thus simplified and no longer dynamic. The roof was replaced from composite panels to tinware and the proposed media facade never happened. It's much cheaper than planned, yet still impressive. The stadium retained its solar symbolism with intensive orange-to-red facade, like the sun rising above the horizon. And rising quite high, too. The stadium's height is 50.1m due to lack of underground levels (high water table and flood risk). The seating bowl is less compromised by cost-cutting measures as it was entirely ready in 2016, when the redesign process ended. Its key point is the placement of temporary sections throughout the perimeter, allowing reduction in capacity by almost 15,000 after the World Cup. It was a wise step with the entire republic's population of under 1 million. It seems that Saransk won't see any of the 'white elephant' effect. 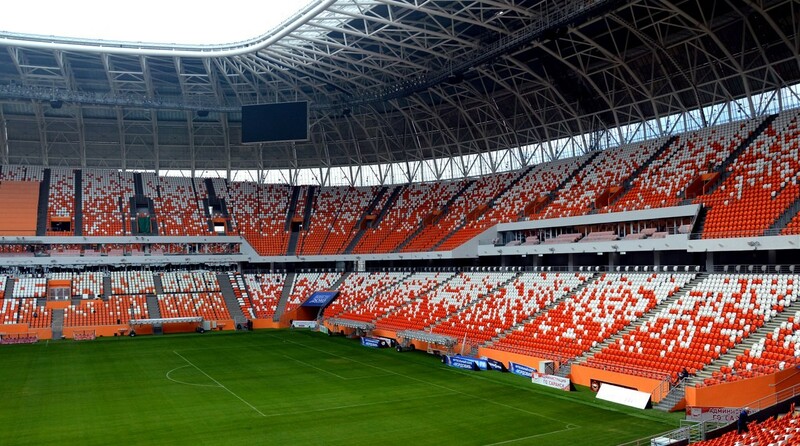 Even though FK Mordovia isn't a major brand in football and never really drew massive crowds, they're just ahead of the biggest opportunity to change that. Along with opening of the new stadium they also secured promotion to the 2nd league and the third test match (first with all sections open to the public) drew an all-time record crowd for a third league game: 41,057 people! Even in legacy mode the stands will have 2 tiers, but the upper one much reduced, ending with additional floor space for leisure uses. Indeed, the plan is to create as many recreational facilities at the stadium as possible, making it Mordovia's prime leisure destination. Altogether there is over 122,000 m2 of space available, spread across 5 levels. Due to its early start and turbulent design history, the stadium took unreasonably long to deliver, almost 8 years. However, bulk of the work was done within less than 3 final years. It's thus no wonder that price has been up and down over such long period, beginning under RUB 10 billion and then speeding towards 20 billion. Eventually, with the cost-cutting campaign, it stopped well below, at some 16.5 – 17 billion.